"Path through the Fields, les Bassacs", oil on linen panel, 12" x 12"
Every day at my workshop in Provence this June, I hammered away at my students about the importance of "shapes" in painting. Now I'm back home again, and walking through the fields where I was painting today, I was reminded again how much clearer and stronger those landscape shapes are in Provence than they are here in Vermont. In Vermont, it's not easy to see clear shapes in an overwhelming green summer landscape. If I look hard, I can find compositions in the structure of houses or barns, roads, even telephone lines and poles. "Two Miles from Town", oil on linen panel, 20" x 20"
But in Provence, the landscape is organized by centuries of agriculture and habitation. Light is intense, colors are strong, and shapes are everywhere I look. "Walls in Bonnieux, watercolor, 14" x 20"
In every village, walls provide a rectilinear geometry. They cast hard-edged shadows that seem as solid as stone. Cypress trees are punctuation points, marking distance with diminishing sizes. Stuccoed walls of houses are strong color shapes. Shutters are vivid notes of violets and blue, green and red. Roofs are orange quadrilaterals, juxtaposed with cerulean distance. Paths have a distinct color and value, light ochre or Naples yellow triangles receding into fields, often cut by shadows that define their flat plane. The vineyards and orchards the paths run through are studies in contrast of hue and shape: bright greens and reds, straight lines and curves. And, of course, the lavender of Provence. Where else than in a lavender field can a painter use Winsor Violet straight from the tube, and plenty of it? The people of Provence have created shapes as strong and striking as the natural ones that surround them. Tiles and pottery relate, with their intense colors and clear patterns, to the land outside. When I slid open this miniature door on the wall of my staircase where I stay in Provence, the little bird nesting inside rustled its feathers. Above everything, the sky unifies all of Provence's varied colors and shapes. Its intense blue forms a backdrop to the details of home, the sweeping panorama of fields, and the shadow and light on village walls. 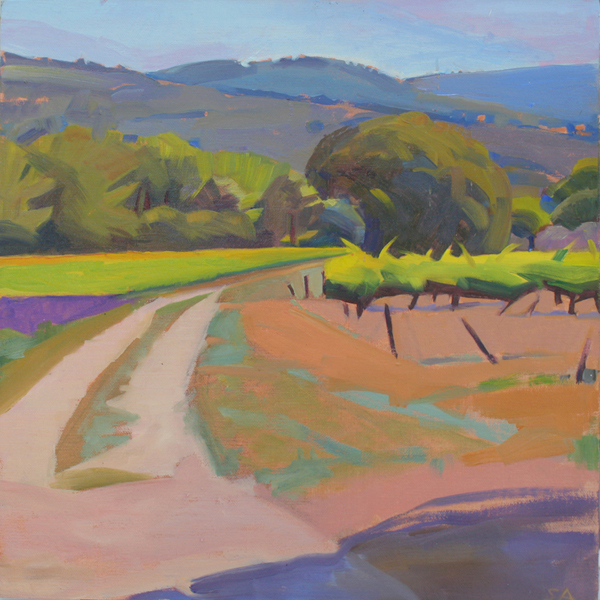 Even when the light fades, this Provence landscape has clarity and color, form and design. We can see, and feel, the poetry of these shapes. Like everything else in the world, they are right there for us to paint.